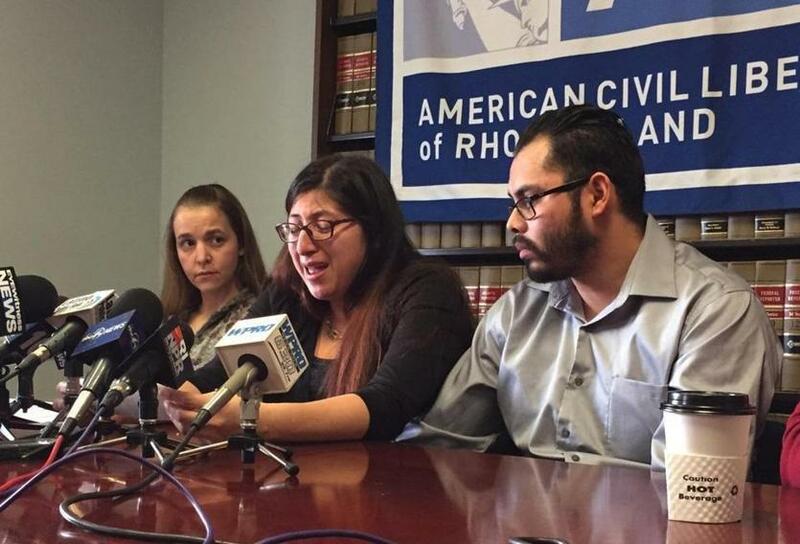 Lilian Calderon spoke at a news conference in Rhode Island after she was detained by ICE as she attempted to apply for legal permanent residency. Luis Gordillo, her husband, is at right. Arrests of undocumented immigrants in the Boston area rose more than 50 percent in the last fiscal year, according to federal data, signaling that President Trump is pushing to fulfill a campaign vow on bolstering enforcement. With his administration shifting priorities away from targeting criminals to going after anyone in violation of immigration laws, arrests nationally have grown 30 percent in the same period. Still, the total number of arrests was far lower than during President Barack Obama’s first term. US Immigration and Customs Enforcement officials in the Boston area arrested 2,834 immigrants who were in the country illegally during the 2017 fiscal year, which ran from October 2016 to September, compared with 1,858 arrests in the previous fiscal year. Trump was in office for about three-quarters of that time. The increase was largely due to a surge in “noncriminal” arrests, a figure that more than tripled from 343 to 1,106, the data showed. But Boston-area advocates and immigration attorneys say ICE is going after “low-hanging fruit,” in large part by targeting immigrants who had previously been granted stays of removal, but who are required to regularly check in with ICE. “The people they are harassing now are the most sympathetic, the most law-abiding people. Some of them have been [allowed to stay] for years,” said Susan Church, an immigration attorney and past chair of the American Immigration Lawyers Association of New England. Church offered the case of about 50 Indonesian Christians who have been living on the Seacoast of New Hampshire and the South Shore of Massachusetts, some for decades, as an example. Most in the group came to the country in the late 1990s and early 2000s, during a period of anti-Christian violence in Indonesia, and are parents of US-born children. Many overstayed their visas and failed to seek asylum on time. But since 2010, immigration authorities allowed the otherwise law-abiding Indonesians to live and work here, provided they checked in regularly. That changed when Trump took office. The immigrants were told in August to report back within 30 days — with plane tickets to Indonesia. At least one was arrested and detained. They sued, and this month a federal judge issued an order temporarily stopping the deportations. In another case in January, Lilian Calderon was detained by ICE as she attempted to apply for legal permanent residency, according to the ACLU of Massachusetts and Rhode Island. Calderon, 30, was brought to the country from Guatemala when she was 3 and is married to a US citizen. The couple, who have two young children, had just finished an interview with immigration officials that confirmed the legitimacy of their marriage — the first step in changing her immigration status — when Calderon was arrested and brought to a Boston detention center. The civil rights organizations sued, and Calderon was released last week. “In this case, the government’s left hand beckoned her forward, and its right hand grabbed her,” Steven Brown, executive director of the ACLU of Rhode Island, said in a statement. While ICE’s 2017 Enforcement and Removal Operations Report did not include local figures for the countries of citizenship for immigrants removed from the United States, it said that nationally nearly 90 percent come from Mexico, Guatemala, Honduras, and El Salvador. Nationally, ICE arrested 143,470 immigrants in the country illegally during the 2017 fiscal year. The number represents a 30 percent jump and the highest number of arrests in three years. The increase started days after Trump took office and his administration shifted enforcement priorities. Although arrests increased in 2017, ICE arrested twice as many immigrants — more than 290,000 nationally — during 2009, the first year Obama was president. During the eight years Obama was in office, arrests by ICE went from 292,545 to 110,104, according to federal figures. In November 2014, Obama announced a package of executive actions that prioritized arresting and deporting criminals, people considered threats to national security, and recent border-crossers. Those steps resulted in a decline in arrests during the final two years of his presidency, Rachel Rosenbloom, a Northeastern University law professor who specializes in immigration policy, said in an e-mail. There was a 17 percent drop in removals at the border last year, which ICE said in the report “showsthe deterrent effect” of increased efforts in the interior of the country. The number of removals, or deportations, in the Boston Area of Responsibility, which includes Connecticut, Maine, Massachusetts, New Hampshire, Rhode Island, and Vermont, increased about 44 percent last year to 1,942 immigrants, according to the report from ICE. Some immigration experts attribute last year’s increase in arrests to a return to enforcement practices of previous administrations, such as using so-called collateral arrests — detaining the intended target of an arrest and whoever else might be nearby and is in the country illegally — and arresting immigrants with old orders of removal but who had been allowed to stay with certain parameters. Akilah Johnson can be reached at akilah.johnson@globe.com. Follow her on Twitter @akjohnson1922.